In every culture that enjoys drinking, their is an interesting culture of what might be called "drunk food." 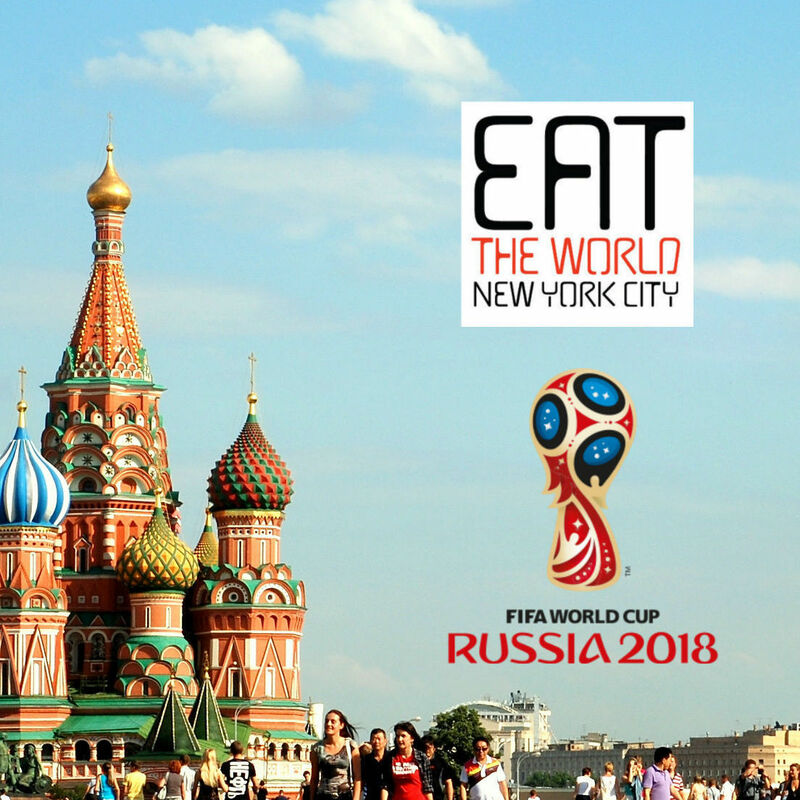 For longer than these pages have existed, Venezuelans in New York City proved their royalty in this arena with the Inwood truck called Patacon Pisao and/or El Dugout, depending on when and with whom you are speaking with. 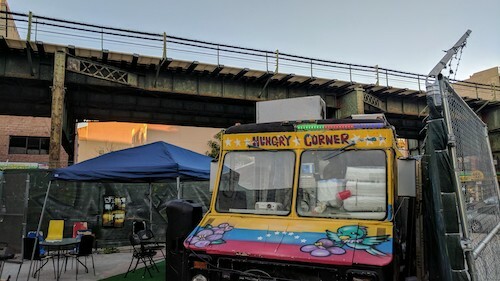 Under the J and Z trains on Broadway at the border of Bedford-Stuyvesant and Bushwick, another truck has more recently opened up serving the same types of Venezuelan street foods. 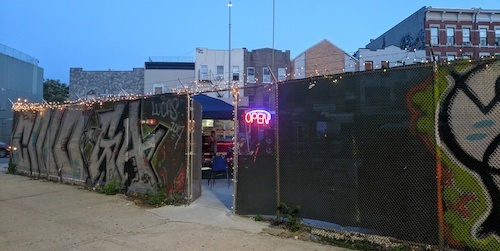 Opening up around the midway point of happy hour and closing sometime in the wee hours of the morning, the truck alternatively called Papelón con Limón and Hungry Corner has a Venezuelan flag emblazoned across the front and an entire three-sided plaza for the use of its customers. It seemed appropriate to attack the mother of all drunk foods, the pepito, a sandwich full of so many ingredients you would not know if they gave you the wrong meat until you bit down. The most expensive at $8, the beef version is called the Brooklyn Bridge (above). Both at $7, the Manhattan Bridge comes with chicken and the Queens Bridge has pork. 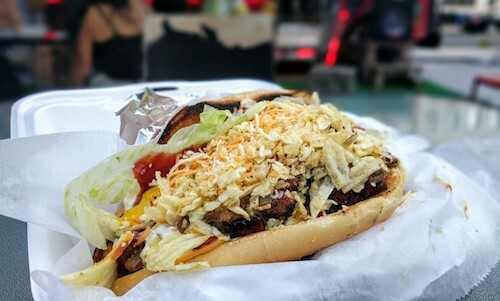 On the streets of Venezuela where this is enormously popular, you may find versions that are more simple and focus on the cuts of meat between bread. Here that is not the case, and two types of fried potatoes, lettuce, cheese, onions, ketchup, mustard, and mayo all adorn the sandwich. By the time the bread is finished, half of what was inside will have dropped to the plate so consider taking a fork at the beginning. 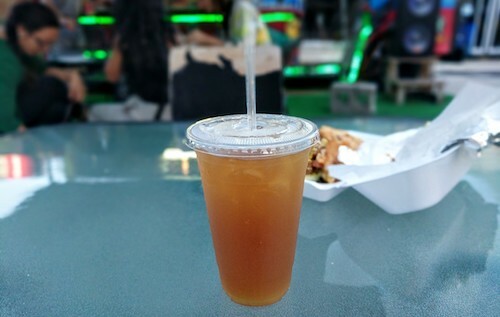 The truck is named after a popular drink of raw sugar cane juice and lime, so it was a no-brainer to order a papelón con limón ($2.50, above) to wash it all down. It is still tasty in winter, but summer days just scream for this refreshing beverage which is made to order. Also available are arepas, cachapas, and pinchos, skewers of grilled meat. The plaza that is home to the truck is an enjoyable place to hang out, even if the music is turned up quite loud. The only thing missing is the alcohol, but you came full of that already didn't you?